Like all schools and their educators, we are also committed to the personal development of young people. We want to help to expand their view of the world and take on their own future. We want to make young people aware of the other socially relevant themes that play beyond their own world of living. Students learn not only to know a new culture, but they also learn to work in a group and personally experience how enriching it is to give others a better future. Your students learn a lot about personal development, self-esteem, their language skills will improve, they learn to live and work in an international and intercultural environment, expanding their view of the world, putting their education in an international light, it is a preparation for a possible internationally-taught career, ... An international experience during the course is undoubtedly an extra asset to you when you start applying for work. With more than 10 years of experience in social work in Laos, we believe that we are an interesting partner for schools in developing a schoolproject abroad. A school project is a fully-fledged alternative to the classical (end-of-year) journey or can be integrated into it, combined and supplemented with cultural excursions on the spot. We believe that a school project is an added value to several subjects and objectives of the curriculum. "A once in a life experience for your students"
At a construction camp, as a school, you will let your participants discover and experience something unusual. Do you want to show your students that life is not as evident as they are used? 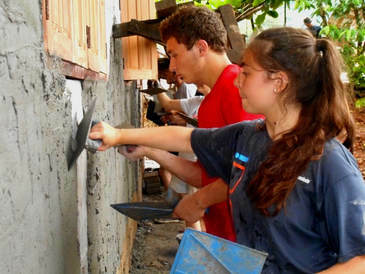 Then a construction camp to Laos is something for your school. You fundraise money in group for your own project and then develop this in group on-site. We do not set a minimum that needs to be fundraised. You decide your budget in advance, and this is the base for our consultation with the local people to see where there is a need at the moment. No know-how to raise budgets for a construction camp? No problem, we want to give everyone the chance to discover Laos regardless of his background. Therefore it is also possible to take a immersion trip. An immersion trip is about the same as a construction camp, with the difference that you do not fundraise money for your own project. During a trip, you will work at our sponsored projects. Be aware that flexibility is limited with immersion trips. We are flexible on details like budget, duration, itinerary, start and end dates, trip theme, etc. Our only requirement is that you recruit at least ten people to be on your team – this can include a mix of students, teachers and parents (max 25 participants). 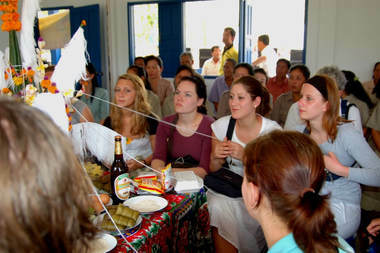 Each group does provide at least 1 adult accompanying teacher per 10 students. We have some sample programs but these can be easily customized to your liking. This allows you to rebuild more leisure time or activities provided by us. We do not exclude anyone, and want to give each type of organization / school a chance to get to know another culture. At the participants we only ask a good basic condition and mental health. You come to places where you live in primitive conditions and the different climate. The project work that you do is tailored to your physical possibilities. It's not a very tough trip but you have to take into account that it's not a typical tourist trip. HELP US BUILDING MORE SCHOOLSlik hier om te bewerken.